A cat stuck up in a tree with a crisp packet on his head had to be rescued this morning (May 20). 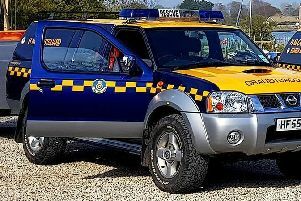 The RSPCA responded to the animal’s ‘golden blunder’ in Thicket Lane, near Chichester, at around 10am after a resident called for help. Marie Stevens, RSPCA welfare officer, climbed around twelve foot up the tree to save the tabby – believed to be a feral – along with the help of two colleagues. Inspector Stevens said: “I reached out to the cat and managed to quickly whip the crisp packet off of his head before he panicked and disappeared further up the tree. “As soon as I pulled the packet off, the cat jumped from the branch to freedom and ran off. Kirsty Watling and Shelly Cash – animal care assistants from the RSPCA’s local branch, Mount Noddy Animal Centre – helped AWO Stevens with the rescue to ensure she was safe. “The cat didn’t seem to be injured or particularly ‘frazzled’ by his experience and ran off as soon as he was freed,” inspector Stevens added. If anyone finds an animal in distress, like this cat, please call the RSPCA’s emergency 24-hour line on 0300 1234 999. If you do see a cat stuck up a tree or trapped on a roof, please monitor them - as it may well be that they are able to make their own way down. It can be, when they are given time and space, they find their way down without help. Often it helps if they are left alone as crowds, dogs and people may stress and panic them.